Summer time is the best time to try out new recipes for your family. 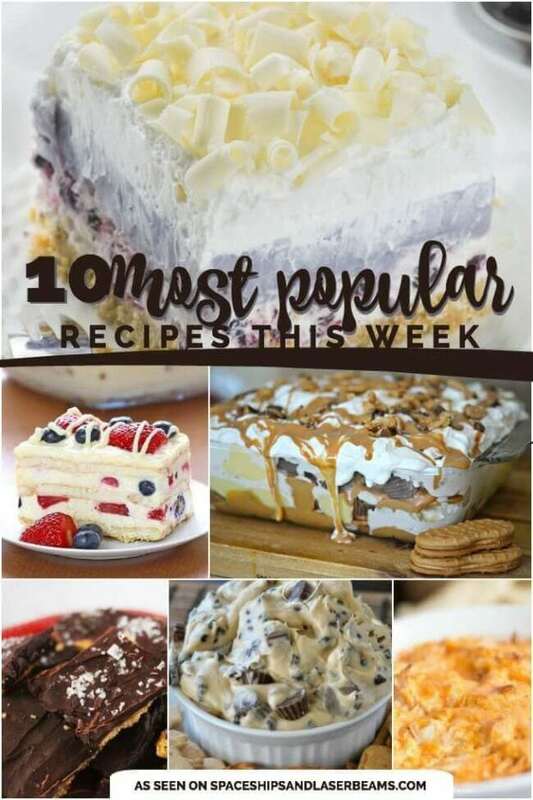 Get started with these great dessert and recipe ideas hand-picked by our Facebook followers this week! Satisfy your sweet tooth with Ritz Cracker Toffee, No-Bake Summer Berry Ice Box Cake, Peanut Butter Cookie Lasagna, Reese’s S’mores, White Chocolate Blueberry Lasagna, Strawberry Cheesecake Chimichanga, and Red, White, and Blue Cheesecake Cake. Plus, you don’t want to miss Buffalo Chicken Dip, Peanut Butter Cookie Dough Dip, and Spinach Artichoke Dip for great additions to your next summer party. Add this Extra Cheesy Mac & Cheese to your lunch or dinner menu. Give breakfast a boost with this Blueberry French Toast Casserole. 1. Ritz Cracker Toffee :: Spaceships and Laser Beams :: Share it on Facebook HERE. Get ready for a new addiction. 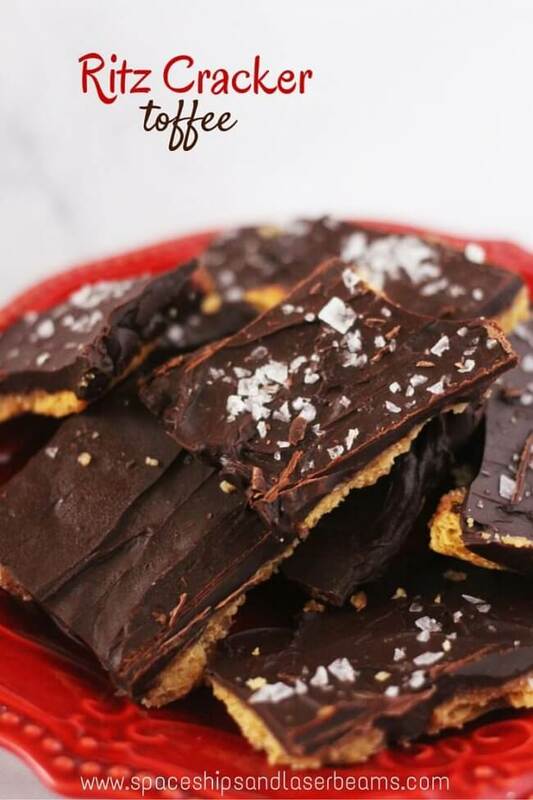 Ritz Cracker toffee, a.k.a. “Christmas crack”, is so delicious and totally addicting. Four ingredients and twenty minutes of prep are all you need to whip up this recipe and feed your craving. You’ll need a support team to share with and keep you from eating the whole pan yourself. There is a reason this recipe is one of the most popular on our site this week. 2. 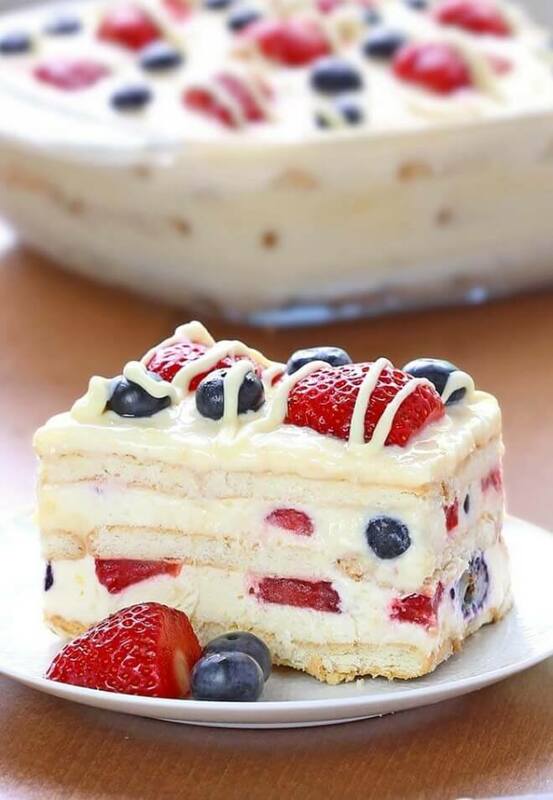 No-Bake Summer Berry Ice Box Cake :: Cakes Cottage :: Share it on Facebook HERE. When summer temperatures are soaring, this no-bake summer berry ice box cake is an especially great choice (who wants to turn on the oven in summer heat?). The beauty of this delicious cake is how easy it is to prepare (even the day ahead). Simply layer graham crackers, cream cheese pudding mix, and fresh berries. Drizzle white chocolate over the top and store it in the refrigerator until serving time. The graham crackers combine with the moisture from the fruit and pudding and turn into a nice cake-like texture. 3. 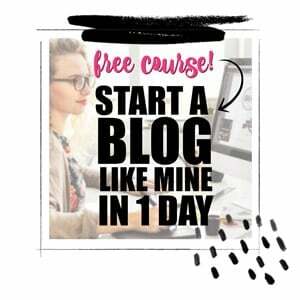 Spinach Artichoke Dip :: Rae Gun Ramblings :: Share it on Facebook HERE. Short on time, but need an amazing appetizer? 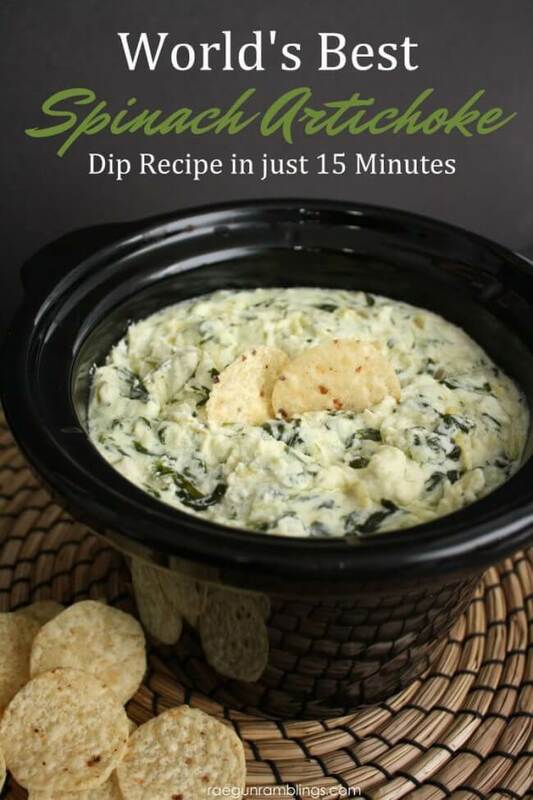 This spinach artichoke dip can be prepped and ready to serve in just 15 minutes! Pair it with chips or slices of crusty bread. It will be gobbled up in no time! It’s perfect for parties and potlucks! 4. Buffalo Chicken Dip :: Spaceships and Laser Beams :: Share it on Facebook HERE. 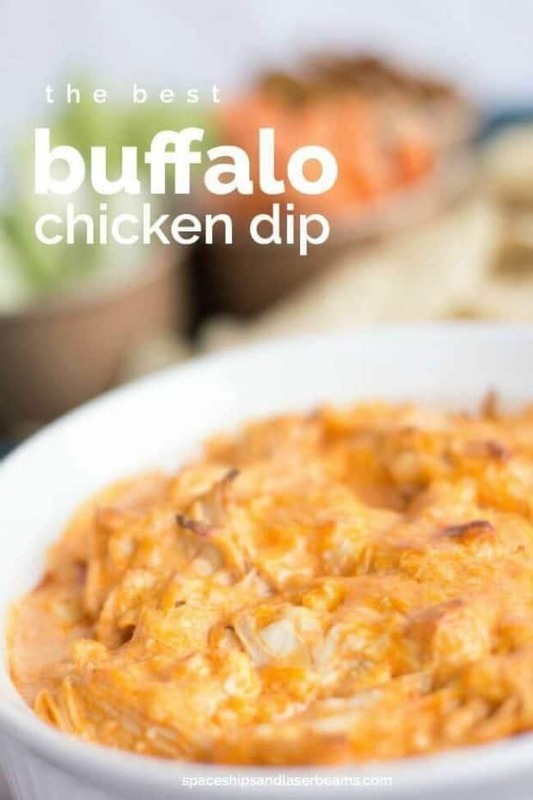 A definite winning recipe, this buffalo chicken dip can be made in your crockpot! Not only is this recipe easy to prepare, but the delicious combination of cheese, hot sauce, chicken and dressing will keep you and your guests coming back for more! The flavor explosion pairs great with your favorite chips and is a perfect party appetizer. 5. 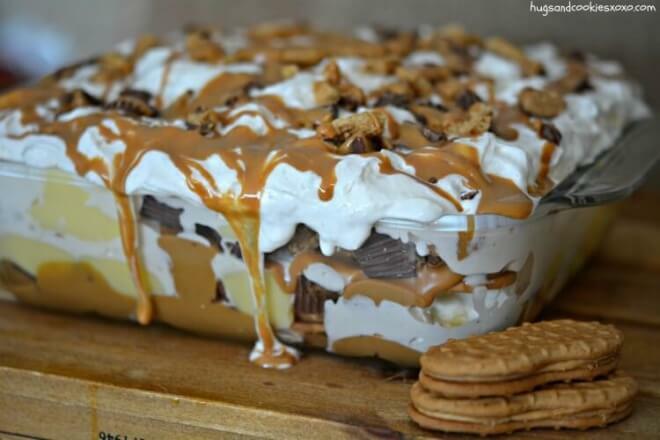 Peanut Butter Cookie Lasagna :: Hugs & Cookies :: Share it on Facebook HERE. Peanut butter heaven really exists, and they serve up this peanut butter cookie lasagna. You can make it yourself by layering Nutter Butter Cookies, drizzles of melted peanut butter, vanilla pudding, whipping cream, and chopped peanut butter cups. It requires 24 hours or more in the refrigerator before serving, which makes it a great make ahead treat. 6. 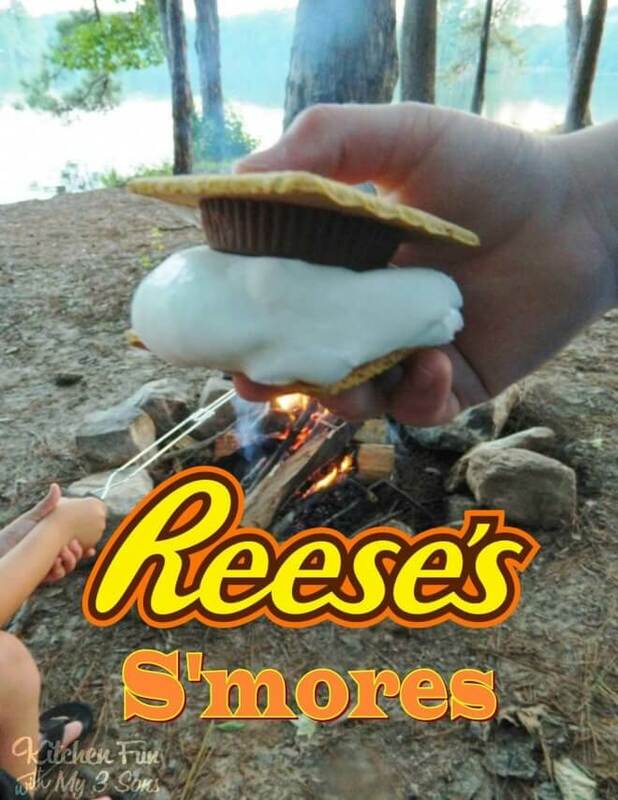 Reese’s S’mores :: Kitchen Fun with my 3 Sons :: Share it on Facebook HERE. S’mores are a dessert staple in most homes, especially during the summer months. But have you ever tried this variation which features Reese’s Peanut Butter Cups instead of the standard chocolate bar? Slide a peanut butter cup in the center of two graham crackers and add a melted marshmallow. The result is a gooey, chocolatey, peanut butter concoction that is definitely a fun twist on a classic! Reese’s S’mores may just be your new favorite way to do S’mores. 7. 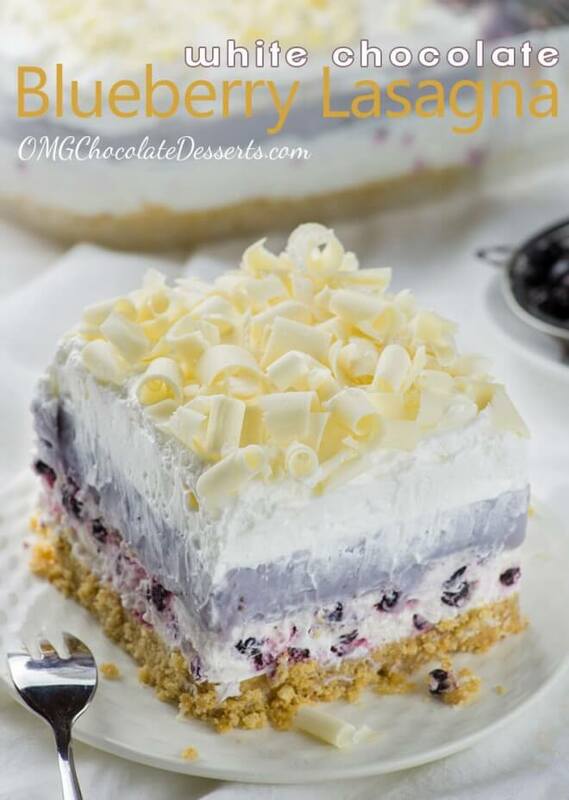 White Chocolate Blueberry Lasagna :: OMG Chocolate Desserts :: Share it on Facebook HERE. A perfect summer dessert recipe that is no-bake, this white chocolate blueberry lasagna is simple to make. Light and refreshing, it starts with a Golden Oreo cookie crust topped with layer after layer of cream cheese, blueberries, white chocolate, blueberry pudding, whip cream, and a final layer of white chocolate curls sprinkled on top. 8. 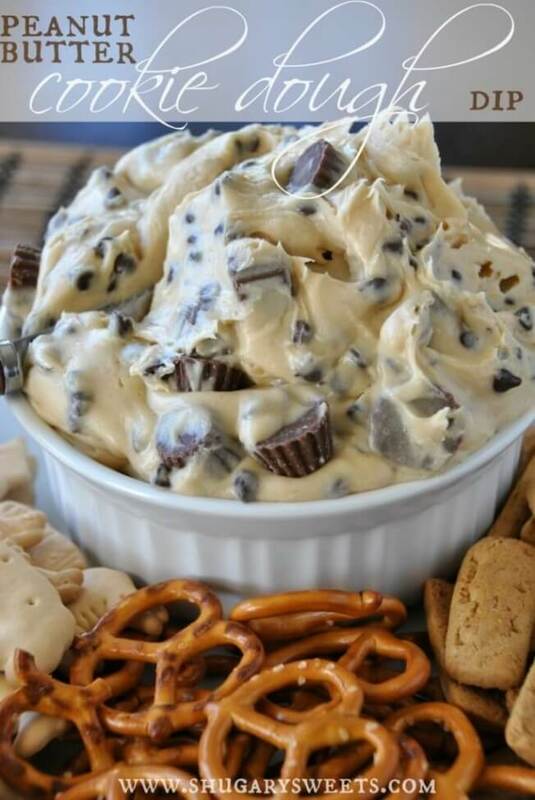 Reese’s Peanut Butter Cookie Dough Dip :: Shugary Sweets :: Share it on Facebook HERE. We may need a moment of silence for this Reese’s Peanut Butter cookie dough dip. Seriously. Imagine a cream cheese based dip sweetened with brown sugar & powdered sugar and made extra creamy with the butter and peanut butter. Then comes the really amazing ingredients. Chunks of mini Reese’s Peanut Butter Cups and mini chocolate chips. Are you drooling yet? Dip pretzels, animal crackers, and graham cracker sticks. 9. 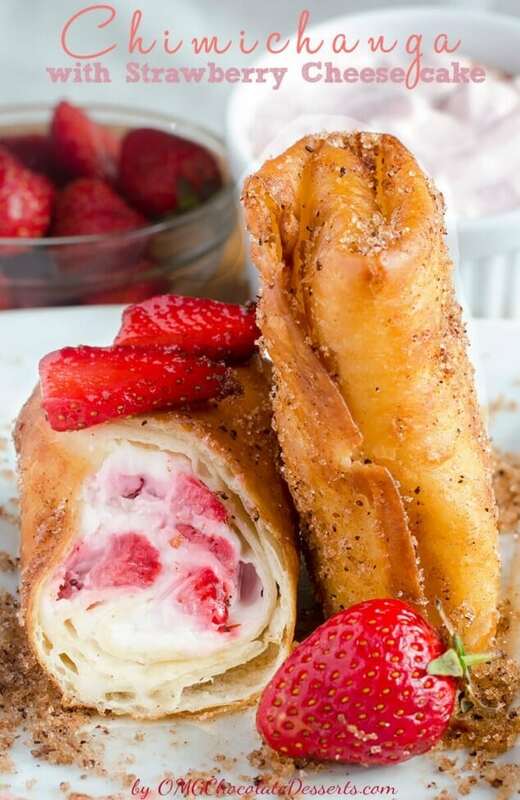 Strawberry Cheesecake Chimichanga :: OMG Chocolate Desserts :: Share it on Facebook HERE. Get ready for something extra special! This recipe for strawberry cheesecake chimichangas is a winner! Spoil loved ones by serving these up at a special breakfast. This is a classic sweet meets salty pairing that will have you dreaming for more! Heaven sounds a little like fried tortillas filled with a mixture of strawberries and cream cheese, rolled in sugar and cinnamon. 10. 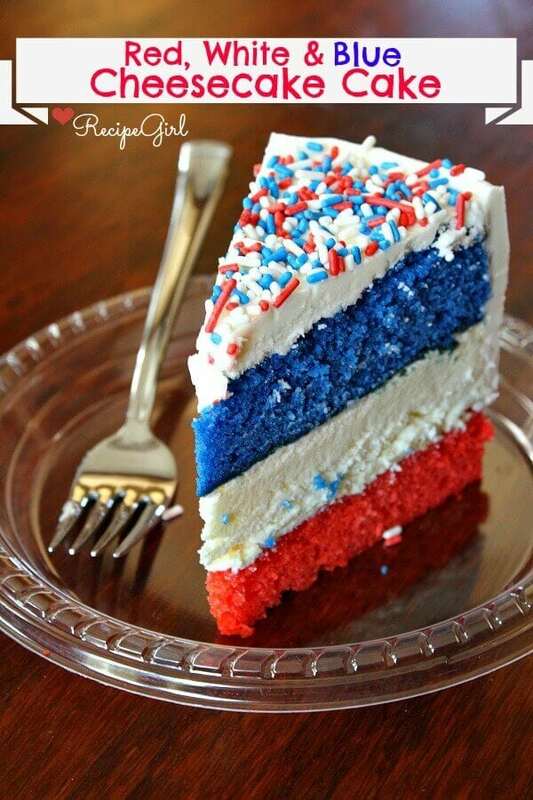 Red, White, and Blue Cheesecake Cake :: Recipe Girl :: Share it on Facebook HERE. Looking to impress at this year’s patriotic party? This red, white, and blue cheesecake cake is sure to do the trick. It features an easy-to-make vanilla cake recipe, with a little gel paste utilized to create the festive colored layers. This cake features a layer of cheesecake sandwiches between two layers of cake—the perfect combination for cake and cheesecake lovers who can’t decide between the two. Cool off this summer with these great sources gathered by the crew at Spaceships and Laser Beams to help create a delicious summer treat. 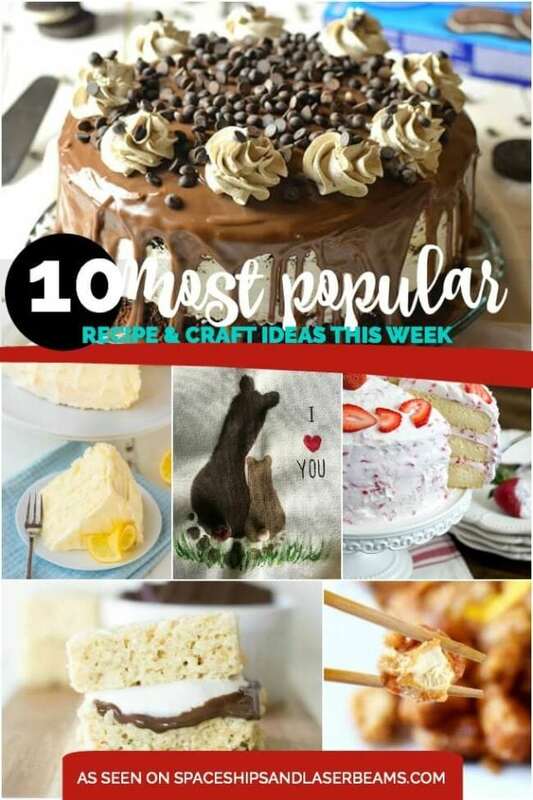 Check out more great summer ideas you’ll love.